Click here to Contact Us or Register for stock updates and news of new products and events. We are dedicated to the restoration of fine shotguns and their accessories. Using a finely balanced combination of traditional and modern techniques and materials, we work tirelessly to bring these beautiful examples of true craftsmanship back to full working condition. This coming year's show is to be held on 25th to 28th April and we are really looking forward to it. If you want a heads up on the guns we will be exhibiting there, be sure to register for Updates as we send out a pretty comprehensive stock list shortly before the event. and present awards to the High Gun and Runner Up. and we have exhibited at the new venue in Maryland the last two years. full details of the event can be found at this link. This is a wonderful event that we have exhibited at some nine times before. However with challenges at home and a UK show planned for February we have regretfully decided to miss it in 2019. Hopefully we will be back again in 2020. Details of this event can be found at the link below. We were very excited to be exhibiting this February at the National Exhibition Centre, Birmingham. and felt that finally there was a domestic event that we could support. I have to say it was everything we had heard....and more! We have already booked for next year. In 2018 we had a really successful show and sold a surprising number of beautiful old shotguns. and naturally the foot fall on the last day was slow. 1st Type Holland & Holland Royals complete with their double and single cases. All in all a great show plus a nice few days staying over with Bob and Barbara Nay of MacNab Fine Firearms at their lovely home in the Virginia mountains.Apparently we are off to pastures new in September 2019, full details of the event can be found at this link. Here are a couple of photos of the event. This Woodward ‘Automatic’ sidelock ejector no 5241 displays some styling features of earlier guns such as the bolstered tumbler pivots, classic Woodward engraving style and unique safety slide but has moved into the modern era with wood ‘stocked to the fences’ and no breech side-clips. New stock and forend have been fitted by a highly experienced professional. The original ‘Special Gun Barrel Steel’ barrels had become painfully thin by 1972 which explains the additional steel barrels by Chaplin of Winchester. Engraving remained wonderfully crisp on locks, action and barrels and the main focus of our restoration has been to TIG sleeve the original barrels, replace pins and have interchangeable long-series Teague chokes fitted. 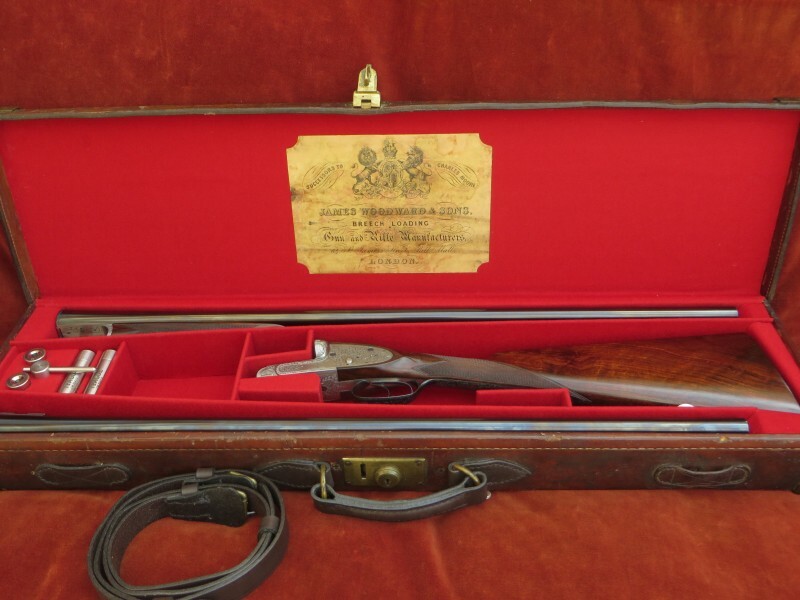 Presented in its contemporary Leather & Brass case, blocked for both sets of barrels, relined in new wool baize and fitted with reproduction case label, spare Teague chokes, Teague choke key and some accessories. This Boss gun no. 4217 was made shortly after John Robertson bought Boss & Company and developed it into probably the most exclusive London gunmaker of its time. 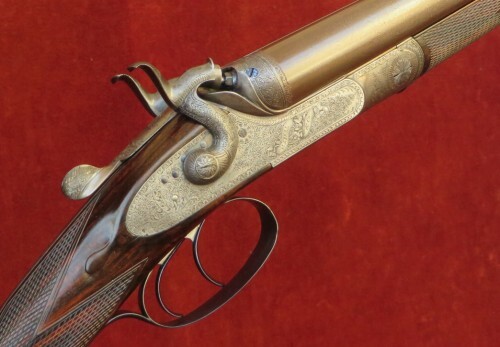 With its bar action locks, elegant sidelever and superb Sumner engraving, this gun represents the departure from Robertson’s predecessor, EF Paddison’s very traditional preference for back actions and rotary underlevers. 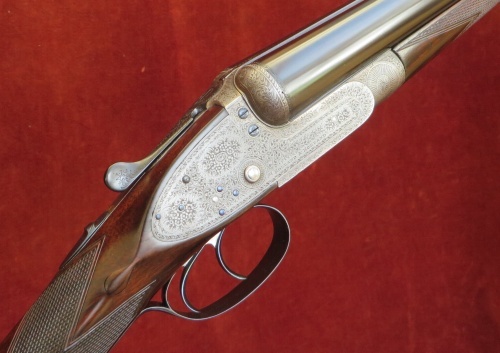 We have had the gun reproofed for 2 ¾” ammunition and following a sensitive restoration, we are pleased to be able to offer a beautifully balanced gun for game or clays. This beautiful bar in wood hammergun is a 16 gauge, made by James Purdey when the hammergun still ruled the game shoot. The engraving is still crisp on the locks and action and the barrels have survived remarkably well considering its 145 years. The antique replacement stock and forend are in very good condition with no cracks in the bar as is so often found in this style of stocking and they show a lovely figure. This time a backaction, this Purdey hammergun represents an unusually fine condition example of the early centrefire hammerguns made by this illustrious Maker. It is lovely to find a gun of this age which still bear its original damascus barrels and although we are not totally convinced it is the original, the stock is of totally the right style for the age of the gun and the inletting is of the very finest quality. 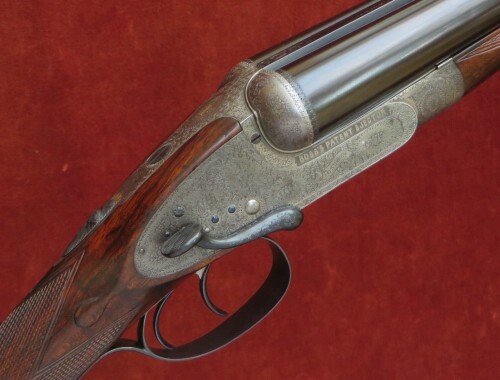 The engraving is still crisp on the locks and action and this coupled with the sensitive restoration, fresh reproof, excellent wall thicknesses and good stock dimensions makes it a very pretty and highly 'shootable' gun for either game or clays. Presented in its relined Oak & Leather case with reproduction Maker’s trade label and some accessories. Click here for the more information. Holland & Holland records show that gun no. 14495 opposit was sold to ‘E.A. Lee’ and it is a fascinating and quite rare example of Hollands’ style transition during the establishment of their first factory in Harrow Road in 1893. 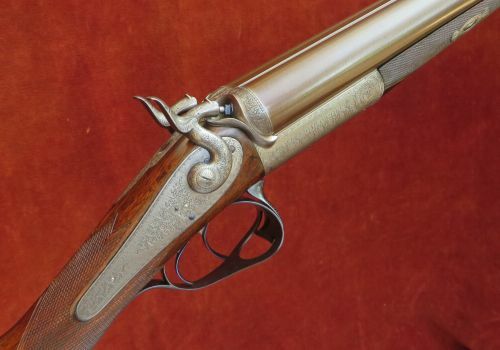 Although the internals remain broadly similar to the earlier, pre-1890’s Royals, the makers’ records shows this gun as the new style ‘No.2 Royal’ (not to be confused with the No.2 quality SLE’s) and it exhibits the new lock plate shape and evolution of engraving from fine bouquet & scroll to the new Art Nouveau bold foliate. Presented in its Leather & Brass case with some named accessories. 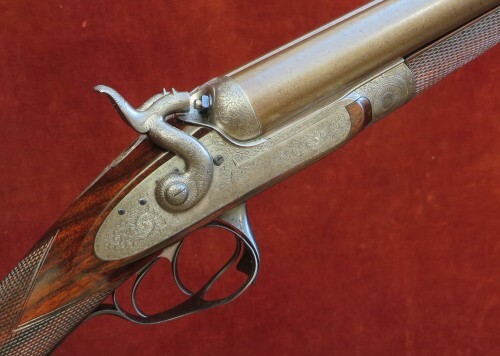 This J Lyell & Co hammergun is in amazingly fine condition. Built for Lyell by the famous lock- and gunmaker Joseph Brazier in Wolverhampton, the action and lockwork is of very high quality as one would expect. Two rare and interesting features are a two part hinge pin that screws together from either side of the bar and a bolting mechanism very similar to William Powell’s famous lift-up top lever patent but operated by a broad, normal toplever. The chokes are reversed, often referred to as ‘grouse chokes’, which is traditional for a gun intended for shooting driven Scottish Red Grouse. With its beautiful bold damascus barrels and finely figured stock, this represents a very rare opportunity to acquire a fine hammergun from this innovative era. More details on this unusual gun here! We have become familiar with the cartridges of RST Ltd through the US double gun competitions and exhibitions that we attend and can thoroughly recommend their products. Their range includes many light loads for those shooting classic guns or simply wanting to take advantage of light recoil and improved patterns. For those not able to access CIP standard ammunition, we would strongly recommend the use of the RST Ltd cartridges in our guns, ensuring of course that the correct case length and load is used for the gun in question. Technical inquiries about RST Ltd cartridges should be addressed directly to them.